Most people choose to get tattoos because they tell a story, and this is definitely the case with Rihanna and Chris Brown, except they are definitely not like most people and their story is more like an extremely complicated saga. On-again, off-again, on-again, off-again…it’s not easy keeping up with RiRi and Breezy’s roller coaster romance, but their tattoos definitely help us try to follow along. Since the couple began dating in 2008, they have both consistently captured headlines for a variety of reasons, the most horrific of which includes Chris Brown’s assault on Rihanna in 2009, and the most interesting of which includes their many, many tattoos, including tributes to one another. To help keep you in the loop, we’ve compiled a comprehensive timeline of the RiRi and Breezy saga as told through their tattoos. Check it out below! 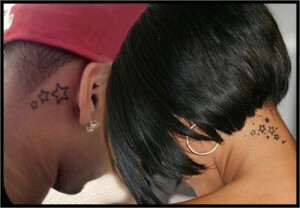 Throughout 2008 and the first month of 2009, Rihanna and Chris Brown were all lovey-dovey and even went so far as to cement their relationship with matching tattoos. The pair visited a tattoo artist in L.A. in 2008, and got matching, but not identical, stars tattoos inked on their necks. RiRi’s tattoo featured a few tiny stars scattered on the back of her neck and Breezy’s tattoo included three larger stars inked on the right side of his neck, directly behind his ear. That same year, while Rihanna and Breezy were performing in New Zealand in November, the couple decided to get matching traditional tribal tattoos inked on their hands. Rihanna’s Maori hand tattoo symbolizes aroha (love) and mana (strength) – which she will need much of three months later when Breezy is arrested for basically beating her to a pulp on the night of the Grammy awards. Chris Brown’s tribal hand tattoo is similar to RiRi’s and is inked on the same hand, but his includes a hibiscus flower. 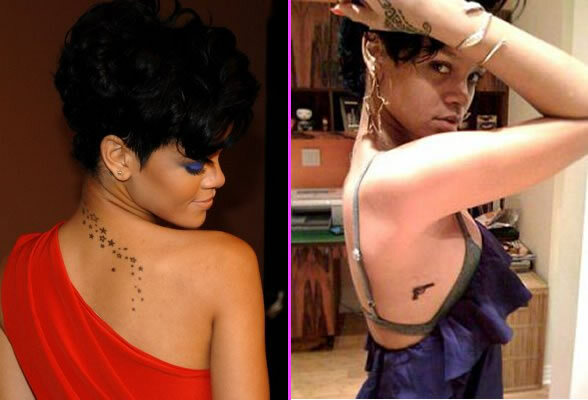 After their violent and highly-publicized break-up in 2009, RiRi hit up the infamous Keith “Bang Bang” McCurdy and added many more stars to her neck tattoo to make it more her own and less matchy-matchy with her ex. Rihanna’s attractive stars tattoo now extends down her neck and back, curving towards her right shoulder blade. 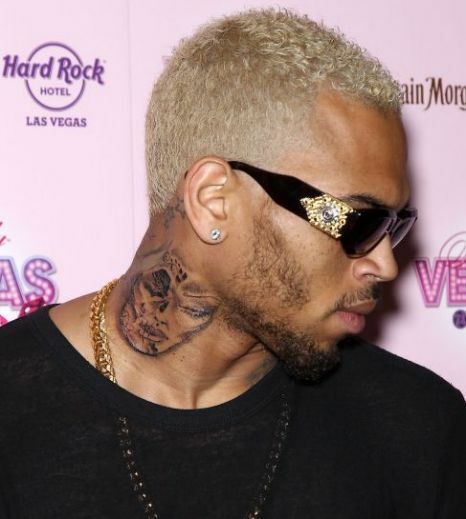 Chris Brown notably left his stars tattoo alone…just in case. 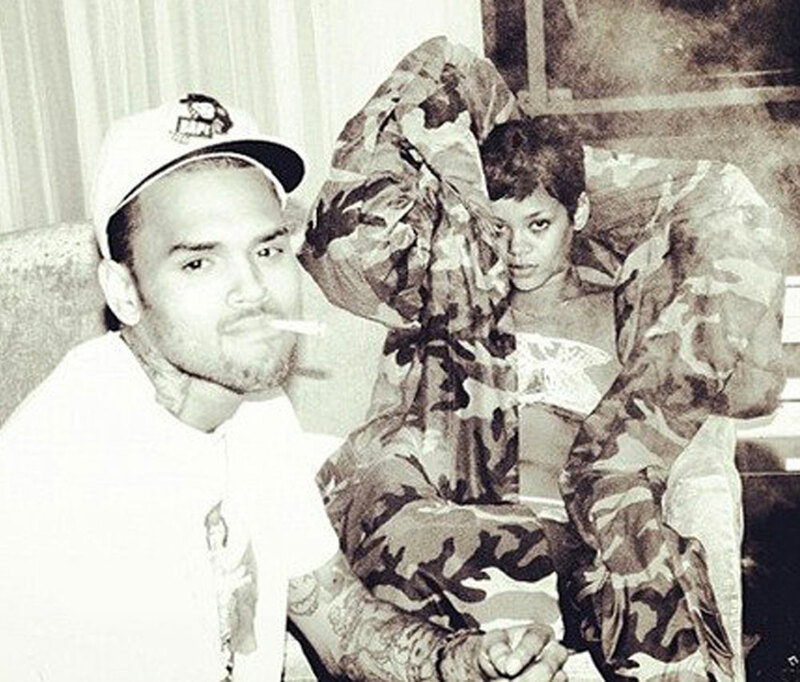 It was at this time that Rihanna added a small gun tattoo on her side, which some speculated was a symbol of strength and vigor for the beaten star, showing Chris she was no punk. THEN come rumors that Chris Brown and Rihanna might be getting back together – to the horror of most people – but Breezy surprised us all by getting involved in a seemingly serious relationship with model Karrueche Tran. He proved his devotion to Karrueche in the best way he knows how – by getting her face inked on his arm in January 2012. 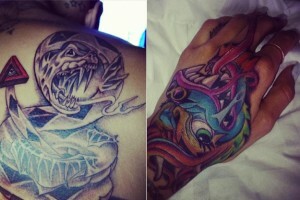 Shortly after, it was rumored that Breezy & K Tran got matching dragon and snake tattoos (they were inked at about the same time), while many Chris Brown fans speculated that the “impossible triangle” featured in Breezy’s snake tattoo was meant for his RiRi – K Tran love triangle. Not long after Breezy’s snake tattoo was revealed, he got a woman’s faced tattooed on his neck, which many thought resembled a battered Rihanna. It was later revealed that it was a “sugar skull” type “Dia de Los Mueurtos” tattoo, and had nothing to do with RiRi. It was at this time that Rihanna got her Goddess Isis chest tattoo, and only days after that, Breezy got his fighter jet tattoo IN THE EXACT SAME SPOT. Coincidence? Don’t think so. 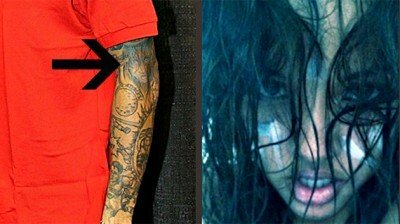 Chris Brown’s K Tran arm tattoo lasted only slightly longer than his relationship with her, and the singer had the tousled-haired tat removed in December 2012, a short 11 months after getting the model’s face inked as part of his sleeve tattoo. Shortly after this tattoo removal news hit headlines, Breezy was seen cuddled up in Rihanna’s arms, so she apparently approved of his gesture of love. During a teary interview with Oprah in August 2012, Rihanna admitted that, despite their volatile relationship, Chris Brown is, and will always be, the love of her life. Breezy was kind of on the same page as RiRi, although he released a very strange confession-like video in October 2012, in which he admitted that he was in love with two women at the same time – Rihanna and Karrueche. Uh oh. Since that time, Rihanna has seemingly dug herself deeper and deeper, while Chris Brown has consistently alluded to some potential extra-curricular activities involving ex-girlfriend Karrueche Tran. 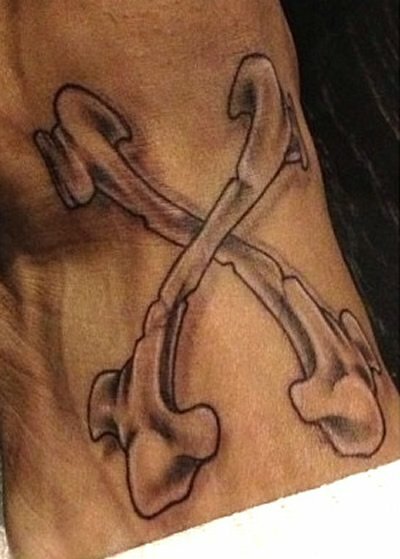 In February of this year, Breezy added a crossbones “X” tattoo to his collection, and we all assumed it was the title of his upcoming album. The singer may have had some controversial inspiration for his “X” tattoo though, as some speculated the ink could represent his X-girlfriend, Karrueche. In fact, Chris Brown reportedly admitted just in March that the title song of his new album refers to “an ex-girlfriend.” Hmm…we wonder who that could be? If he keeps this up, it could very well be Rihanna as she moves on to the f— you tattoo phase. More recently, in April 2013, Karrueche Tran gets a HUGE tattoo of a poem on her ribcage, which some speculate is directed towards Breezy. The quote scrolled down her left side reads; “A beautiful life does not just happen, it is built daily by prayer, humility, sacrifice and love. May that beautiful life be yours always,” and it could be letting Chris Brown know that her life will be just fine without him. FINALLY, as of right now, Rihanna and Chris Brown seem to be back together. AND there are even rumors that RiRi is preggo, since she has canceled a few shows in a row due to “illness.” What will the next chapter bring us?? Who knows, but we would bet every last dollar that there will be many more tattoos involved!! Who do you think will get the next tat? Breezy? RiRi? Only time will tell, and probably not much time knowing these two.